I’ve been riding bikes long enough to vividly remember the heyday of suspension stems. Back then, the stage was dominated by Girvin and Allsop/Softride — and both actors were terrible. But that was then, and this is now, and much to my surprise, the Redshift Sports ShockStop suspension is really, really good. Why on earth would anyone be interested in a suspension stem for a road or gravel bike, you might ask? That’s a very fair question. Modern bikes now have a remarkable degree of compliance engineered into the frames and forks even compared to just a few years ago, and it’s often more than enough to make most rides on decently paved roads feel buttery smooth. Likewise, we’ve also already established that tire pressure is the most important determinant in the ride quality of a road bike by far, and a change of even just a few psi can make a world of difference. But as previously discussed, there are practical limits to how much a bicycle chassis can flex in a desirable fashion, or how far we can decrease tire pressure, before it negatively influences other performance aspects. And perhaps most importantly, not all of us are blessed with pristine asphalt. Originally launched on Kickstarter in 2015, the ShockStop comprises a pivoting stem with two small elastomer inserts tucked away inside the square-shaped extension — and that’s it. That extension rotates on two cartridge bearings, and both the stem base and extension are made of forged-and-machined aluminum. It’s easy to see from this angle how the squared-off stem extension presses down on the two elastomer blocks when a rider hits a bump. There isn’t a third elastomer to protect against a harsh top-out, but I only found that I wished for one on rare occasions. And even then, it’s more of a dulled thud than a disturbing metal-on-metal sensation. The laser-etched graphics are pleasantly discreet, and although there’s little hiding the fact that the ShockStop isn’t a standard stem when you look at it up close, the design is sufficiently stealthy that most observers wouldn’t have much of a clue that anything out of the ordinary is going on. But, according to Redshift Sports, there’s up to 20mm of vertical movement available (measured at the hoods). RedShift Sports offers the ShockShop in 90-120mm lengths with a common +/-6° angle, and a -30° angle in a lone 100mm size. All feature standard 1 1/8″ steerer clamp diameters and 31.8mm handlebar clamp diameters, with a removable four-bolt faceplate for easy installation and servicing. Five different elastomer inserts are included so that riders can fine-tune the stiffness to their liking. Actual weight for my 100mm x -6° sample is 277g. I didn’t want to like the ShockStop stem as much as I did. Looking back at the fleet of high-end road racing bikes I’ve ridden with their sleek lines and painfully efficient builds, the ShockStop just seemed a little … silly. 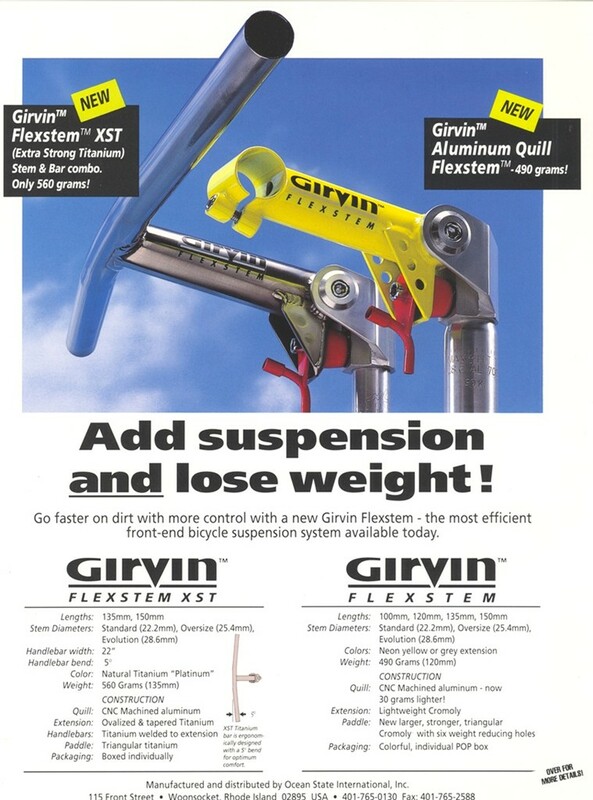 Perhaps I was also still a little scarred by those Girvin and Allsop stems of yesteryear. I’ll also admit that I even put off installing the ShockStop on a bike for quite some time after company co-owner Stephen Ahnert handed me a sample at the Interbike trade show in 2016 (sorry, guys). But I eventually relented, if only for the sake of curiosity. And I’m glad I did, because this little thing genuinely surprised me. Redshift Sports includes five different elastomer blocks so that riders can tune the stem stiffness as desired. I found that the company’s recommendations for my weight were far too comfort-oriented, though. Once I had settled on an elastomer combo that suited my preferred feel, I was duly impressed by the ShockStop’s ability to smooth out the road surface without being obtrusive. As promised, the cartridge bearing pivot doesn’t move out-of-plane even a little bit, but yet the low-friction design is still remarkably sensitive, canceling out high-frequency buzz while also dramatically taking the sting out of impacts that would otherwise threaten to hammer your wrists into bone powder. And unlike the FutureShock coil-spring cartridge that Specialized currently uses on its Roubaix and Diverge — both of which I found to move more than I wanted regardless of which spring I installed — the ShockStop felt appropriately firm. Here, it seemed to me that the movement was more supplementing the ability of the frame and tires to soak up the road imperfections, instead of trying to steal the show all for itself. The ShockStop only impressed me more when I transferred it to a gravel bike. There, it not only provided the same comfort benefits I enjoyed on the tarmac, but also helped maintain front-wheel traction on bumpy dirt roads and singletrack. Sure, the ShockStop was heavier than the stem I once had on there, but the fact of the matter is that I was also going unmistakably faster than I was before, and with more confidence at that. None of that movement felt overly “springy,” either, with the elastomer inserts providing just enough inherent damping to keep things under control. That all said, I also found that my satisfaction with the ShockStop varied dramatically depending on which elastomers were installed. Adjusting the stem stiffness is a somewhat cumbersome process that requires you to remove the handlebar in order to access the aluminum plate and steel bolt that hold the elastomer inserts in place. The stem also has to be installed on a bike, since the stem has to be preloaded when removing or installing the guts. I first started with Redshift Sports’ recommendations for my weight, but there was a disconcerting amount of handlebar dive under braking, and way too much movement overall for my liking, especially on steeper downhill switchbacks or more technical non-paved terrain. It’s perhaps worth noting here that, given the nature of the ShockStop stem’s movement, the hoods inherently rotate down away from you when you hit something; longer stems will minimize that somewhat. Redshift seems to have set its recommended guidelines for riders that are primarily seeking a pillowy-soft ride, and out of 15 total possible elastomer combinations, there are only four that are stiffer than what I chose. In my case, I gradually stepped up the insert densities until I arrived at a combination that Redshift deems more appropriate for a rider 25kg heavier than I am. Given my modest 70kg weight, that doesn’t leave much room for heavier riders that might want a similarly performance-oriented feel, so it’d be good to see Redshift add firmer options moving forward. Performance-minded riders are likely to balk at the ShockStop aesthetics, too. Not everyone will like how the Redshift Sports ShockStop suspension stem looks, but I suspect a lot of riders would be surprised by how well it works. While Redshift Sports did a respectable job of keeping the ShockStop neat and tidy — again, the important bits are mostly hidden away inside — the overall shape is more suitable to mountain bikes than modern road bikes, and the exposed gap between the pivoting extension and fixed base seems a bit unfinished. A bit of molded plastic or rubber, similar to what Trek uses on the Domane’s IsoSpeed widgets, could go a long way toward smoothing out that transition and providing a more refined appearance. And yes, the ShockStop is a bit heavy, but considering the very substantial benefit it provides, the added weight strikes me as more than reasonable, particularly given the broad compatibility with existing bikes. Redshift supposedly has a carbon fiber ShockStop in development, too, which would likely cut the deficit dramatically (and perhaps look better as well). I’m not ready to install a ShockStop on every drop-bar bike I own; far from it. In my opinion, good pure road racing bikes still provide enough give in the frameset and tires when riding on decent tarmac, and most riders will find the 35-40mm tires on gravel setups to be sufficient for those applications. But that doesn’t mean the ShockStop doesn’t have its place. Not everyone has a fancy modern carbon fiber bike with heaps of built-in compliance, after all, and there are plenty of people who do have those bikes and yet still want a more comfortable ride than what’s currently available to them. If the ShockStop stem can surprise me, then I dare say this thing might very well catch a number of other riders off guard as well. Don’t knock it until you’ve tried it.